Methane hydrate is formed when water and methane gas combine at temperatures below 10 degrees Celsius and pressures greater than 30 bar, or 30 times normal atmospheric pressure. 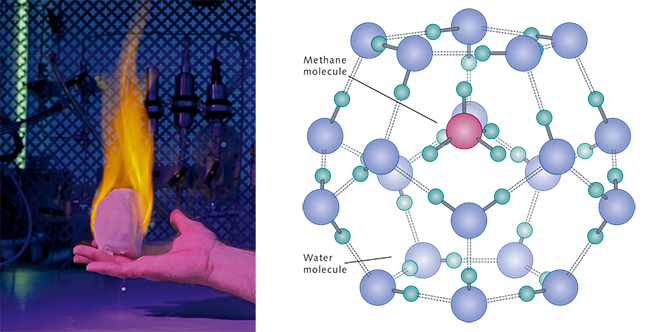 The meth-ane is surrounded by water molecules and trapped in a molecular cage. Chemists therefore call this kind of molecular structure a clathrate (lat. clatratus = with bars, caged). Methane hydrates develop in permafrost regions on land or beneath the sea floor. They are usually covered by a layer of sediments. Their formation under the sea floor requires an environment of sufficiently high pressure and low temperature. The warmer the water is, the higher the water pressure needs to be. Thus, in the Arctic, methane hydrates can be found below water depths of around 300 metres, while in the tropics they can only occur below 600 metres. Most methane hydrate occurrences worldwide lie at water depths between 500 and 3000 metres. The hydrates are solid and white, similar in appearance to normal water ice. When they are brought up from the sea floor they begin to slowly break down. This releases the methane gas that can then be ignited. Under normal conditions methane and water molecules do not react with one another. At room temperature they are moving too quickly to form chemical bonds. At lower temperatures, however, the molecular motion is retarded. Under higher pressures, the methane and water molecules approach each other so closely that the clathrate structure develops. If the temperature rises or the pressure decreases the weak bonds collapse. The clathrate then breaks down and methane is released.